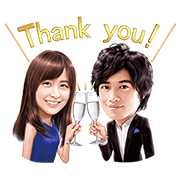 http://www.line-stickers.com/ – Mizuki Yamamoto & Takumi Saito × MIO Line Sticker | This sticker set is only for people 20 years or older. MIO’s newest spokespeople, Mizuki Yamamoto and Takumi Saito, are here to add some refreshing flavor to your chats! Friend MIO Sparkling Sake’s official account to get the set for free. Available till July 5, 2017.